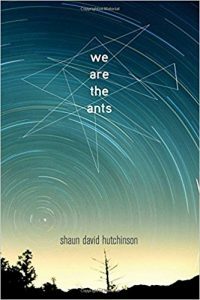 Cassidy Camera, an eighth grader from Florida, recommends We Are the Ants by Shaun David Hutchinson. We are the Ants is not merely a story. This book is artwork; this book is a metaphor. It tells the story of a high school boy who has a pretty terrible life and when faced with the choice of saving the world he chooses not to. It shows another side of the mindset of the clichè “hero;” this mindset being that not everything is perfect. The writing is beautiful, the story is insightful, and it finally provides LGBTQ+ representation past the pointless sassy gay friend. This book is not merely an incredibly written coming-of-age book, but it will make you think and send you spiraling down different trains of thought with the first lines.